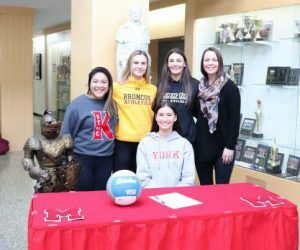 This past month, three of our Knights from the Varsity Volleyball team signed with three different post-secondary institutions as high school recruits. Lauren signed with York University, Sienna with Douglas College, and Francesca with Olds College in Alberta. These young ladies led the STMC Varsity Volleyball team to 1st Place in the BC Catholic Senior Girls tournament and eventually to 3rd place in the Provincials. Their skills, leadership, and competitiveness did not go without the notice of several post-secondary institutions and as a result, were offered a spot on the roster of these respective schools’ volleyball teams. Congratulations once again. Way to represent STMC!